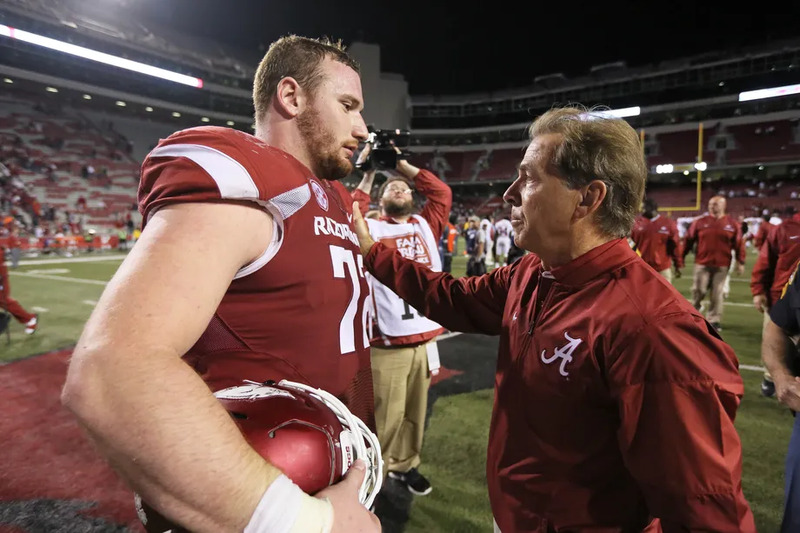 Photo: Nick Saban consoled Frank Ragnow when he chose to play in the Arkansas-Alabama the week after his father died. Ragnow said his father would have wanted him to play. Saban told him his father died when he was a graduate school student. By now, the slicing and dicing of Frank Ragnow's measurables is complete. Some pundits and Lions fans, however, were skeptical. Some felt the 20th overall pick was too high for a center. Others cited more pressing position needs. But another voice belongs to Pro Football and College Football Hall of Fame offensive lineman Willie Roaf. Ragnow won the Willie Roaf Award, presented by the Little Rock (Ark.) Touchdown Club, so the 13-year veteran of the New Orleans Saints and Kansas City Chiefs has studied Ragnow’s game. For Ragnow’s rookie year, the Lions feature flexibility to play him at center or guard as returning veteran Graham Glasglow has played both positions. When Roaf, the eighth-pick of the 1993 NFL draft out of Louisiana Tech, was told some believe Ragnow was taken too high for an offensive lineman, he quickly answered. Ragnow was a three-year starter that entered his senior an All-American and Rimington Award candidate until an ankle injury ended his season after the seventh game. Nevertheless, he was a second-team All-American choice by the Football Writers Association of America and third-teamer by the Associated Press. According to Arkansas statistics, he didn’t allow a sack in his career, covering 33 consecutive starts and 42 games for his career. Measurables aside, all that remains is for Ragnow to prove himself on the field. Roaf can relate to reasons he is high on Ragnow’s character and dedication to the game. Ragnow has spoken about dedicating his NFL career to his father Jon, who died suddenly of a heart attack in the middle of Ragnow’s junior season. Cifton Roaf never earned a letter, having suffered a career-ending knee injury in spring football, but he treasured his time on the East Lansing campus. He met his wife, Andree Layton Roaf, and both graduated from Michigan State. He later returned to Pine Bluff, retiring from a career as a dentist before his death in Sept. 2017. Roaf’s late mother was a lawyer and the first African-American woman to serve on the Arkansas Supreme Court. “I know Frank has got a lot to prove, and I know his dad is watching over him,” Roaf said. “My dad was a hard-working man who never got to play at Michigan State because of his knee injury. My dad and I both believed God sent me here to finish what my dad couldn’t finish. You have a lot to play for when your parents are proud of you."